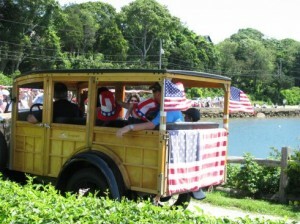 There is nothing like a parade, especially on the 4th of July, and especially in Falmouth, which boasts a number of neighborhood parades. My family and I have been participating in the Moores Parade for several years now, me on flute, my son and daughter in playing sax and clarinet in various years, and my husband joining in on drums on occasion. 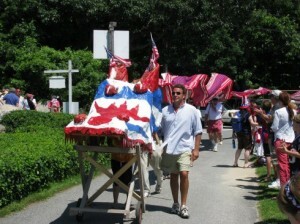 It has always been a very festive parade, ending up back the home of Fran and Walter McLean for a wondrous potluck feast. This year we were invited to participate in the the Quissett parade by Joyce Gindra, who has taken over leadership of the band. I played flute, and my husband took photos. 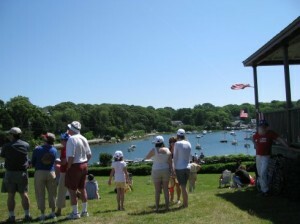 The Quissett parade starts at the Quissett Harbor House (to the left in the photo above), winds around the harbor, and turns around on Route 28A, returning to the Harbor House. It was a beautiful day, sunny, but not hot, and we started off energetically, playing as we marched: “Yankee Doodle,” “The Battle Hymn of the Republic,” and other tunes. 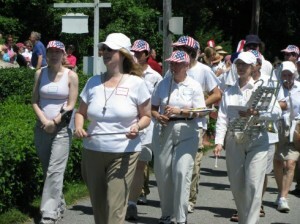 This was the first time I have ever marched and played at the same time. 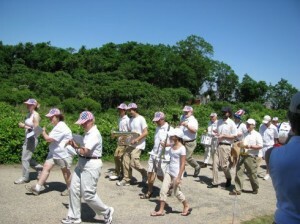 The Moors band marches along, but stops to play songs along the way, then begins marching again. I have to admit it took some getting used to, to hold the flute just right so that the music was in view, and not bouncing around too much. In high school, I was one of a few who was not accepted for the marching band (I actually fainted during one incredibly hot August band rehearsal), so it was an accomplishment just to walk and play at the same time–no fancing march steps were involved today! 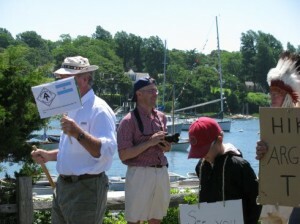 The band and the parade itself was made up of people of all ages and marching abilities, and it was fun to be a part of it, as it rounded Quissett Harbor. 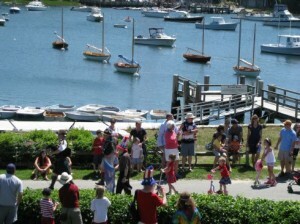 Bagpipers played, and children on decorated bikes and scooters had a great time. There were many decorated cars of all vintages. 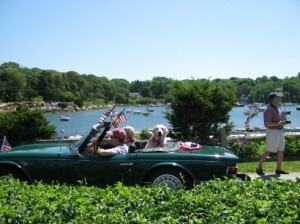 And there were decorated dogs, riding, walking, and watching the parade. Political statements were made. This one has to do with the Appalachian Trail and Gov. Sandford. 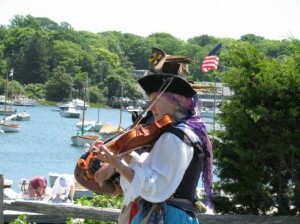 There was a violinist and another string instrument player behind her that I can’t quite identify. And there was a brightly colored serpentine dragon that stretched out for miles, or so it seemed. And all too soon, it was over. The band brought the festivities to a close with a concert of patriotic tunes. We got to play sitting down, and the sheet music stopped bouncing, and a good time was had by all. Tonight the fireworks! 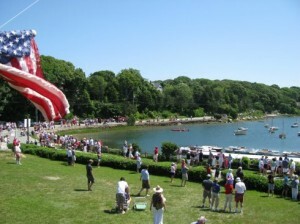 Hope your Independence Day is glorious too!